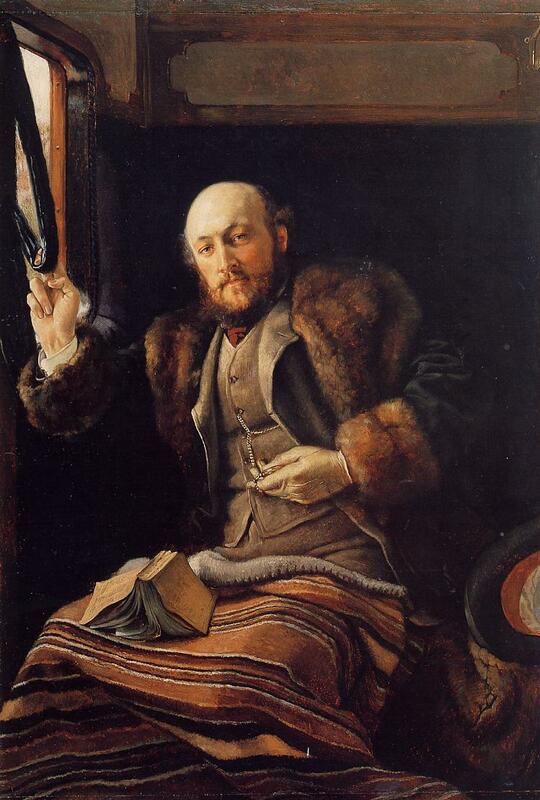 James Tissot, a Realist painter of consummate skill, is known for capturing the fashions of his time in great detail. But he also painted one of the most defining realities of the modern age: new modes of transportation, along with the phenomenon of the lone female traveler. In late May or early June, 1871, James Tissot fled Paris in the aftermath of the Franco-Prussian War and the bloody Commune. He established himself in the competitive London art market, and by March 1872 (and until 1873), he lived at 73 Springfield Road in St. John’s Wood, conveniently near the new Underground Railway station there. His 1872 image of the modern commuter, Gentleman in a Railway Carriage, was purchased for The Worcester Art Museum, Massachusetts by the Alexander and Caroline Murdock de Witt Fund nearly one hundred years later, in 1965, and is currently on view. 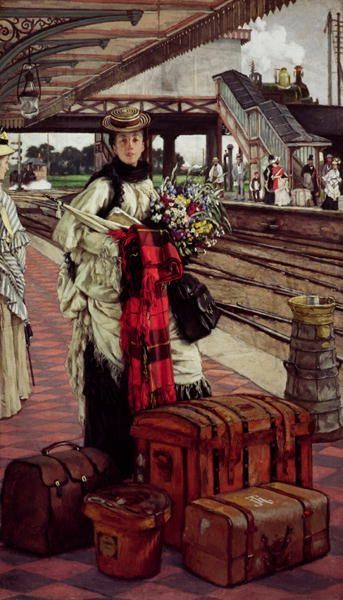 Waiting for the Train (Willesden Junction, c. 1871-73), by James Tissot. Dunedin Public Art Gallery, New Zealand. Willesden Junction is in northwest London, and was brand-new when Tissot painted it, complete with its rubbish bin. The West Coast Main Line station was opened at Willesden Junction by the London & North Western Railway in 1866, with trains traveling to Birmingham and Scotland. The upper level station on the North London Line was opened in 1869 by the North London Railway, which ran trains east-west across Northern London. The modern woman portrayed in this ultra-modern setting looks at us with a direct, confident gaze amid her baggage. It’s a small but fascinating painting, suffused with a delightful ambiguity typical of Tissot. Who is this woman, and where is she going? She seems free-spirited, yet she is enclosed in a jumble of cramped spaces. With his sly and original humor, Tissot signed one of her suitcases with his monogram, J.J. Her purse clasp bears his monogram as well, but it’s hard to see in a reproduction. Crossing the Channel (c 1879), by James Tissot. Tissot became successful quite quickly in London. In 1873, he bought the lease on a medium-sized, two-storey Queen Anne-style villa at 17 (now 44), Grove End Road, St. John’s Wood. By 1876, he was sharing his home with his mistress and muse, Kathleen Irene Ashburnham Kelly Newton (1854 – 1882). 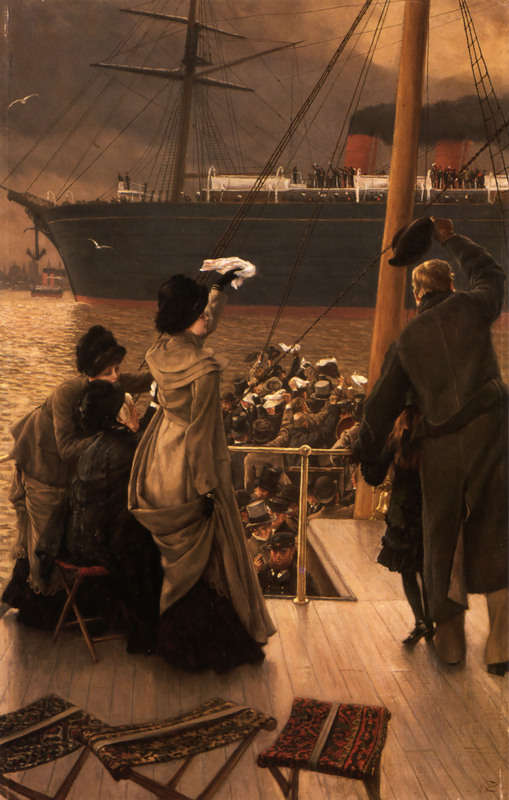 Tissot exhibited Crossing the Channel and The Emigrants, among other pictures, at the the third Grosvenor Gallery exhibition in 1879, the final season in which he participated. Kathleen Newton is the model for the woman in Crossing the Channel, the whereabouts of which are unknown. The Emigrants was gifted to the Speed Art Museum in Louisville, Kentucky by Mr. and Mrs. W. Armin Willig in 1991. 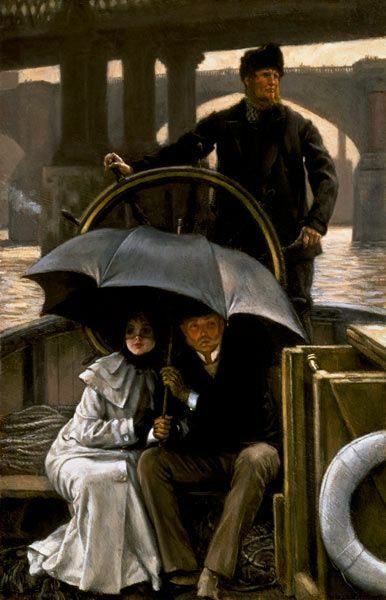 The Ferry (c. 1879), by James Tissot. Oil on panel, 12 by 8 in. (30.48 by 20.32 cm). Private Collection. 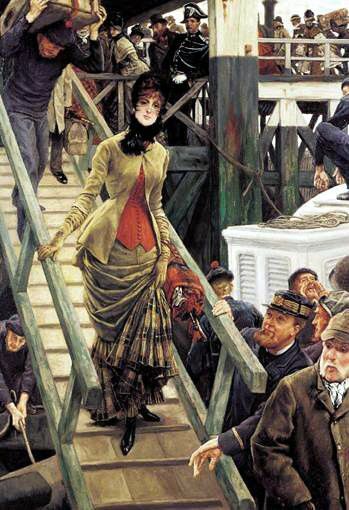 Around 1879, Tissot painted The Ferry, using Kathleen as the model for the female figure. The picture was owned by private collectors including Thomas B. Holmes, Hornsey, East Yorkshire; W.J. Brown, Northumberland (1914); and Captain R.S. de Q. Quincey. In 1993, The Ferry was sold at Christie’s, London for $ 259,335/£ 170,000. Award-winning musical theater composer Andrew Lloyd Webber (b. 1948) acquired “Goodbye” – On the Mersey, which depicts well-wishers on a small local ferry waving at a Cunad steamer setting sail from the port of Liverpool, in 1997. It is one of two known versions painted by Tissot, the other, larger of which was exhibited at the Royal Academy in 1881 and was sold from The Forbes Collection in 2003 to a private collector. The Walker Art Gallery in Liverpool acquired a watercolor version of “Goodbye” – On the Mersey (measuring 16.75 by 12 in./42.5 by 30.5 cm) with an Art Fund grant in 2010. By Water (Waiting at Dockside, c. 1881-82), by James Tissot. Among the works shown were the companion pieces, By Water and By Land, both oil paintings measuring 25 by 11 in. (63.5 by 27.94 cm). In the photograph albums that Tissot kept as a record of his work, the image known as By Water is labeled Un quai d’embarquement à Londres, and the image next to it is labeled Departure Platform, Victoria Station. Incidentally, By Water is signed J.J. Tissot at the bottom left and twice in monogram on the crates. Also exhibited at the Dudley Gallery in 1882 was Tissot’s Leaving Old England (Gravesend), a painting that remains unlocated. In both By Water and Departure Platform, Victoria Station, Tissot relies on Kathleen Newton as his principal model. Mrs. Newton, a divorcée with two children, died of tuberculosis on November 9, 1882, at age 28, at Tissot’s house. Immediately after the funeral on November 14, at the Church of Our Lady in Lisson Grove, St. John’s Wood, Tissot returned to Paris. His days painting Victorians were over, and he would soon begin a new series, La Femme à Paris (The Parisian Woman). The Embarkation at Calais (also called The Traveller, c. 1883-85), by James Tissot. Oil on canvas 146.5 by 102 by 1.7 cm. The Royal Museum of Fine Arts Antwerp. Painted between 1883 and 1885, Tissot’s La Femme à Paris pictures portrayed the fashionable parisienne in various incarnations using brighter, modern colors than he had in his previous work. 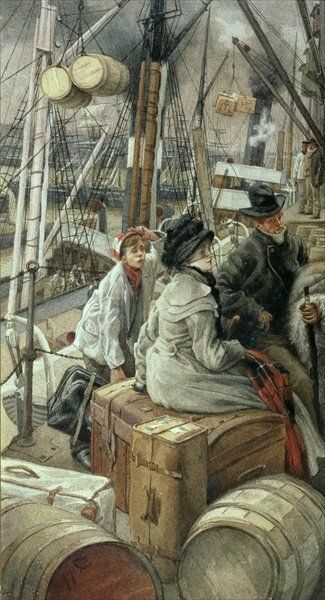 Of the seventeen paintings in this series, only The Embarkation at Calais (The Traveller) seems to portray an English woman, connected with his images of Kathleen Newton travelling. In fact, if you look closely just behind the woman’s head, you’ll see a ghostly figure of a woman wearing Mrs. Newton’s familiar caped greatcoat and black bonnet. 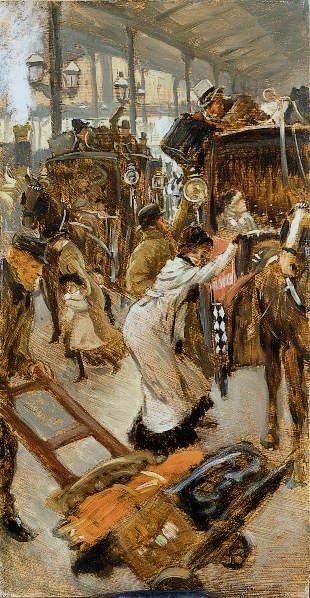 A decade later, Tissot again resurrected the image of Kathleen Newton traveling in The Cab Road, Victoria Station (1895). Sold at Sotheby’s, London in 1964 as Departure Platform, Victoria Station for $ 2,379/£ 850, and sold again with that title in 1983, this picture later belonged to Sir James Hunter Blair (1926 – 2004). Hunter Blair was the Lowland laird of Blairquhan Castle in South Ayrshire, Scotland, a 200-acre estate available as a venue for weddings and corporate events as well as a location for films such as The Queen (2006), starring Helen Mirren. 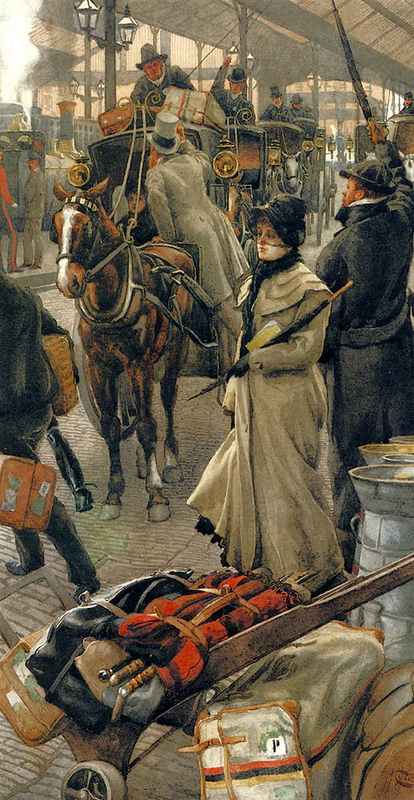 As The Cab Road, Victoria Station, Tissot’s painting failed to find a buyer when it was offered at Christie’s, London in June 2010 and again in December 2010. Update: The Cab Road, Victoria Station (1895) was sold at Christie’s, London on July 13, 2016 for $86,187/£64,900 GBP (Hammer price with Buyer’s Premium). © Copyright Lucy Paquette 2016. All rights reserved. This entry was posted in Art blog, Art History, Impressionists and tagged James Tissot, Kathleen Newton, Sir James Hunter Blair on January 20, 2016 by Lucy Paquette, author of The Hammock: A novel based on the true story of French painter James Tissot.